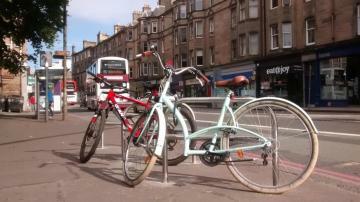 There is a new website in support of the Roseburn to Leith Walk Cycleway. I especially like their promise to be evidence-based and to cover both sides, something increasingly rare in political discourse. We are an informal association of local residents working to get the best for our community from the Proposed Cycle Route. We've spent hundreds of hours gathering the facts. The Council's latest revised design has addressed key concerns. Our site is evidence-based, including the disadvantages. We are ready to engage in discussion with anyone. Tell us about errors or omissions and we'll fix them as soon as we can. Get the best for all residents. This is not a website advocating cycling. It's true that many of the founders do cycle, and many of us also drive. Make decisions based on the facts. We are concerned how many people are voicing fears and criticisms yet don't seem to know about some of the most important data and studies. Listen to all views, and bring people together for discussion. We don't accept the whole notion of classifying people as 'cyclists' and 'drivers'. We are all ordinary people who use a variety of means of travel appropriate to different situations. Jonathan Freedland at the Guardian sums up the state of affairs. They did it with lies, whether the false promise that we could both halt immigration and enjoy full access to the single market or that deceitful £350m figure, still defended by Gove, which tricked millions into believing a leave vote would bring a cash windfall to the NHS. They did it with no plan, as clueless about post-Brexit Britain as Bush and Blair were about post-invasion Iraq. Senior civil servants say Brexit will consume their energies for years to come, as they seek to disentangle 40 years of agreements. It will be the central focus of our politics and our government, a massive collective effort demanding ingenuity and creativity. Just think of what could have been achieved if all those resources had been directed elsewhere. 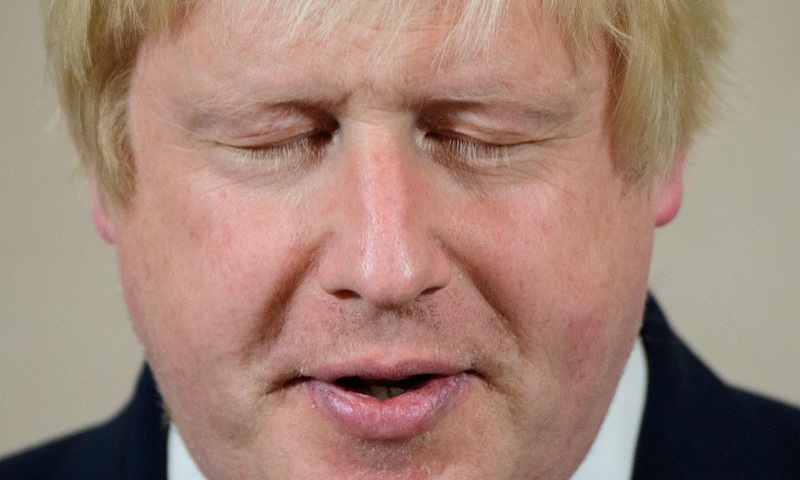 Into addressing, for instance, the desperate, decades-long needs – for jobs, for housing, for a future – of those towns that have been left behind by the last 30 years of change, those towns whose people voted leave the way a passenger on a doomed train pulls the emergency cord. Edinburgh City Council has released its report on consultation on the Roseburn to Leith Walk cycleway, and Henry Whaley has written a comment for the Edinburgh Evening News. The Council have responded to specific concerns from some shopkeepers and residents by reinstating the loading bay on the north side of Roseburn Terrace, increasing the right turn lane and eliminating the floating bus stop whilst maintaining the cyclepath to form a much improved ‘Option A’. The Council are also assessing an alternative ‘Option B’, which would take the cyclepath away from Roseburn Terrace, on an indirect and complicated route involving three road crossings as well as restricting the space for motor vehicles at the already tight Roseburn Street Junction and not widening the Roseburn Terrace pavements. It’s another option, but one that is worse for most people. 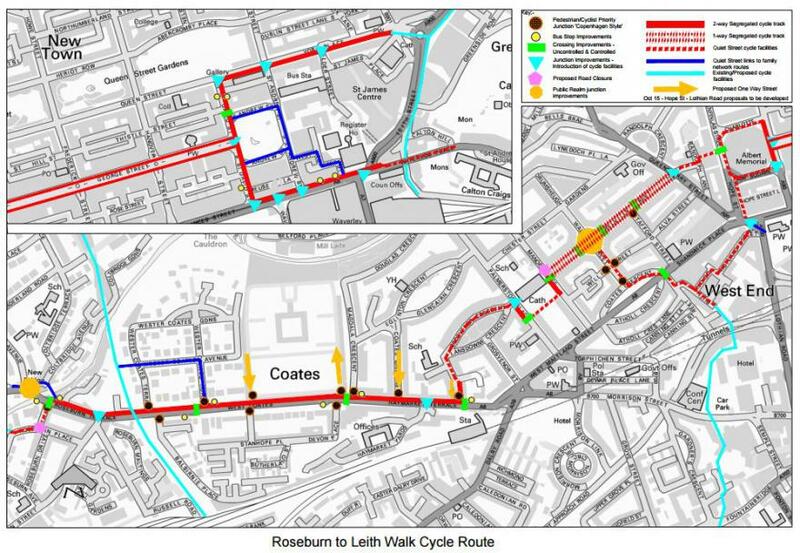 Transport Convener Councillor Lesley Hinds said: "We had an overwhelming response to the consultation and the exercise has been extremely helpful to officers working on the proposed Roseburn to Leith Walk cycleway and street improvements. "Thanks to the feedback received, we've been able to make deliverable adjustments to a number of aspects of the scheme. In terms of the Roseburn section, local concerns have prompted us to present an alternative route (Option B) via Roseburn Place and Roseburn Street for consideration by committee members. However, we remain in favour of Option A because it will enhance the street environment in Roseburn Terrace and is more direct for cyclists - involving one road crossing rather than the three that would be required for Option B. "After further planned consultation with businesses, community councils and the Council's Active Travel Forum, the project team will consolidate feedback and finalise the preliminary design scheme for presentation to the Transport and Environment Committee on 30 August 2016."